Our website will help you search for your ideal home by locating available homes that meet your criteria. It provides fast and comprehensive search utilizing the Multiple Listing Service (MLS) that is utilized by Realtors. You will be able to see the details of a particular home or obtain email notifiations if a home meeting your criteria is newly listed. We will be pleased to provide additional details such as history of the property, tax information, neighborhood demographics, etc. to make sure it is a proper fit for your housing desires. Unlike most other Real Estate Agents, we do not ask you to sign a Buyer's Agreement with us. We understand that if we provide the quality service that you expect, we will develop a mutual commitment to work together to accomplish your objectives. We will provide you a free, complimentary automated Report of Valuation for your home. This report will be comprised of current homes on the market and sales in your immediate neighborhood. It will be sent to you, without obligation, immediately after your submission of your request. Don't delay, contact us today and find out how we can assist you in maximizing the realization of your home's value. We guarantee we will exceed your expectations with our outstanding customer service that we provide to all of our clients. Who hasn’t heard the phrase, “He or she can see right through you?” Since we moved into our new condo in St. Pete Beach last month my wife and I have a new appreciation for those rare human human beings with the power to to do just that. Marcetta Dyer is undeniably one of those people. For anyone moving cold turkey from the frozen tundra to sunny Florida there is much to learn and many pitfalls to avoid. Horror stories abounded and we listened to all we could hear, determined not to make a mistake. Diligence and determined research count, but in the end, for the uneducated, would-be Florida retiree, it will all come down to luck. Your Gulf Coast Home-buying experience might succeed or fail based on your choice of realtors. 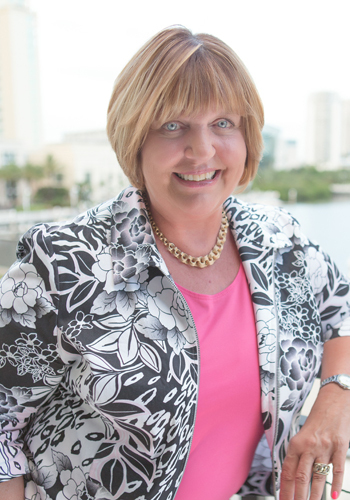 Our professional experience with Marcetta Dyer lasted nearly nine months, far longer than we had anticipated and through that experience we discovered that finding the right Florida home is alot like matchmaking. Marcetta, in the simplest terms, is just a great matchmaker. She took the time and made the effort to really know us. Our interests, our family, our goals, all of it plays a role in the match she makes. There were disappointments along the way, lost deals and rejected offers, but she never lost her patience or tried to shortcut the process. In the end Marcetta found and secured the perfect home for us, the place even my wife didn’t know we wanted. To be fair, however, Marcetta Dyer plays with a stacked deck. She has a secret weapon. His name is Bill Sanders, her husband and the nuts and bolts, detail component of Team Dyer. Picture a slightly more mature and white-haired Rhett Butler, but one with more substance than swashbuckle. Southern charm aside, Bill gave us the facts straight. Where we didn’t have them he searched them out. When those facts didn’t add up in our interest he told us that straight out. If only Rhett and Scarlett could have worked so effectively together.